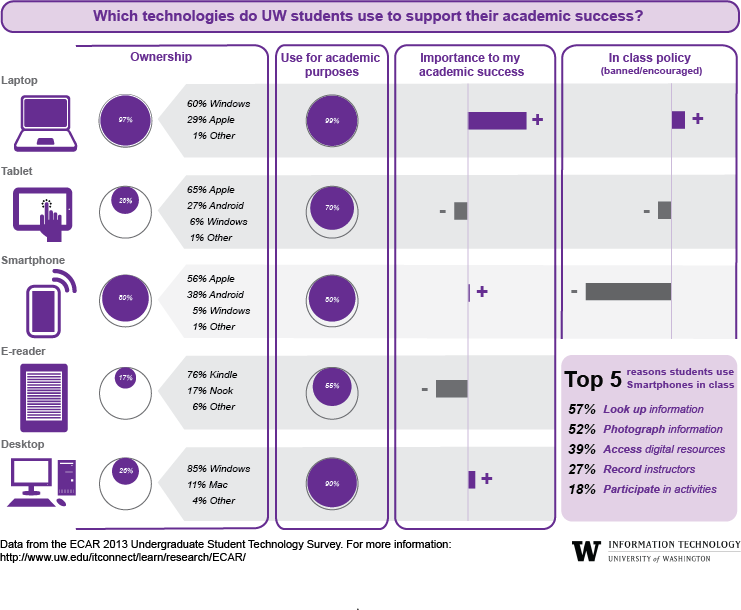 This infographic shows how UW students are using technology to support their academic success. Data are from the 2013 ECAR student technology survey. http://www.educause.edu/ecar/about-ecar/ecar-technology-research-academic-community/participate-technology-research-academic-community (use the InCommon login option to access this information with your UW NetID). In 2014 ECAR is piloting a faculty survey. Both the student and faculty surveys will go out in Winter Quarter 2014. The Academic Services unit of UW-IT works with ECAR to administer the surveys at the UW. The ECAR surveys provide a valuable opportunity for the UW community to learn about the types of technology students and faculty use, how they use the technology, and for what purposes. This nationwide survey also gives the UW a chance to see how technology use compares with our peer institutions.